Nikon has announced the D600, the smallest and most affordable full frame DSLR on the market today. The new Nikon D600 sports a 24.3MP full frame (35mm size) CMOS sensor with a body style, features and control layout resembling the Nikon D7000; including a 39 Point Autofocus System, of which 9 of the AF Points are Cross type. The D600 doesn't skimp on features, as it includes weather sealing, along with the same EXPEED 3 Processing Engine used in higher end Nikon models like the D800, along with a shutter life expectancy of approximately 150,000 cycles. This new Nikon model also includes an Optical Viewfinder with 100% Coverage (a feature normally reserved for the most expensive Pro Level DSLR models), with the performance users demand, allowing the camera to shoot up to 100 JPEG Images at 5.5fps, with dual memory card slots that are able to support the latest SDHC or SDXC cards with UHS-1 support for faster write speeds. The D600 also sports a 3.2" wide angle LCD and built in Flash, along with a hotshot allowing the use of the latest Nikon Speedlights for users wanted more control of lighting. The new Nikon D600 is capable of recording full 1080p HD video at 30, 25 or 24 frames per second, and can stream uncompressed footage out over its HDMI port. The D600 uses the lastest H.264.MPEG-4 AVC Video Compression standards to insure optimum quality with lower storage requirements, and the camera also allows the use of full frame (Nikkor FX Series Lenses) during movie recording for users demanding the Depth of Field control a full frame sensor and lenses can deliver, allowing a shallower Depth of Field at than would be possible with cameras using a smaller APS-C Size Sensor. This new Nikon DSLR also allows the use of an optional WU-11b Wireless Adapter to allow easy transfer of images to family and friends, or uploading images to web sites. Nikon will also make applications available to allow control of the camera from Mobile devices running Android or IOS for even more flexibility. The Nikon D600 will have a list price of approximately $2,099 for the body only, or $2,699 for a kit including a Nikkor 24-85mm F3.5-5.6 lens; and should be available starting September 18th. 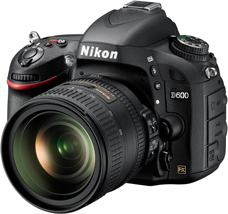 The D600 is a new model added to the Nikon FX-format digital SLR lineup with a smaller size and lighter weight-approx. 141 (W) x 113 (H) x 82 (D) mm, 760 g*1 for excellent portability, yet offers the superior image quality and rendering performance, operation, and durability of high-end FX-format D-SLRs. 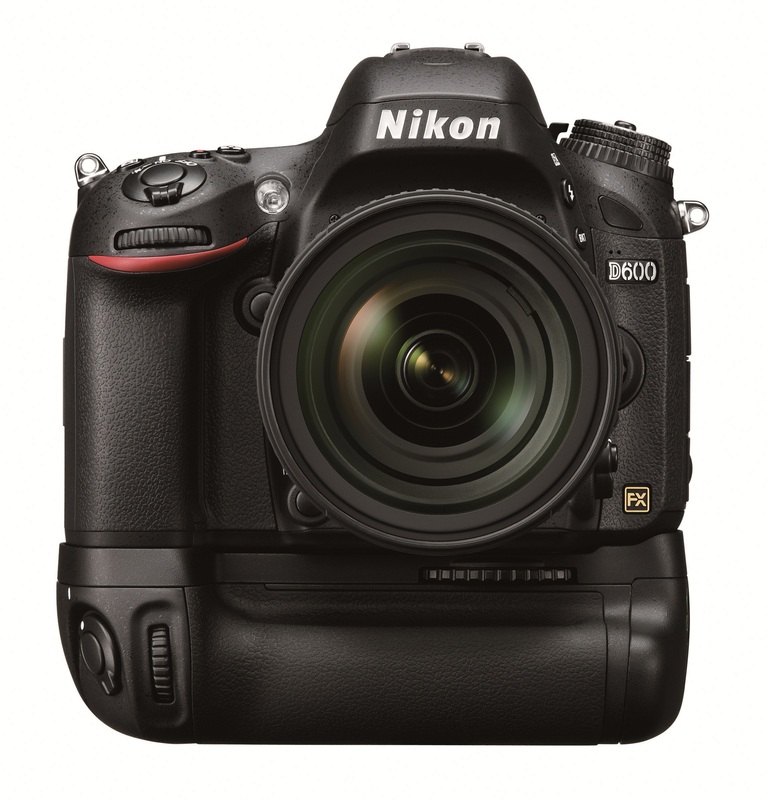 The D600 is a compact and lightweight camera that offers excellent cost performance. In addition to a new FX-format CMOS image sensor with an effective pixel count of 24.3-million pixels and the same EXPEED 3 image-processing engine built into high-end models, the D600 inherits a number of advanced features from its high-end cousins, including an optical viewfinder with frame coverage of 100%*2, a large and clear, 3.2-inch LCD monitor with a wide viewing angle for superior visibility, and the same dust- and water-resistance as the D800 and D800E. What's more, this single FX-format camera also offers support for the complete DX NIKKOR lens lineup for greater convenience with both still image shooting and movie recording. The D600 makes full use of its 24.3-million effective pixels with high-resolution, full-HD movie recording (1920 x 1080/30p). It is also equipped with the Multi-area mode Full-HD D-Movie function, which enables recording in either FX- or DX-based movie format for more creative imaging expression.